Who can use this Sale and Purchase Agreement? 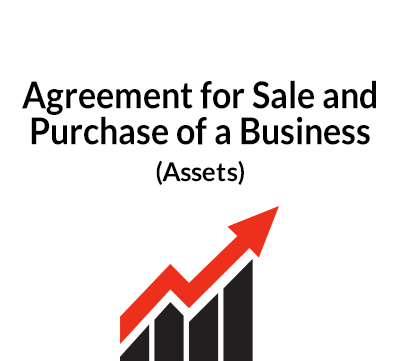 The owners of a company who want to sell their shares and/or a potential buyer who wants to take over a company can use this sale and purchase agreement (SPA). Due diligence by the buyers is very important: this should be in progress while the formal sale and purchase agreement is being negotiated. The sellers will give several warranties in the SPA with regard to the business– e.g. that the accounts are up-to-date, all employees have been properly paid and there are no employment disputes etc. They will also give a disclosure letter to deal with any anomalies – claims, disputes etc. Price and payment. The price will usually be paid on completion but sometimes there is more than one payment and/or an adjustment depending on future conduct of the business. Completion procedure: the sellers will hand over their share certificates with signed share transfers; resignation letters from directors; board resolutions to authorise the transaction and appoint the directors nominated by the buyers etc. the procedure can be quite complicated. Noncompetition: usually the sellers will undertake not to compete with the business, at least for an agreed period. They may agree not to poach staff or customers or use a name similar to that of the company. An annexure allows for a disclosure letter to be written by the sellers. ContractStore supplies templates and is not a law firm. But experienced lawyers write all our templates so we can arrange legal assistance for customers who need special terms in one of our documents or a bespoke template. . For more information see our Legal Services page. 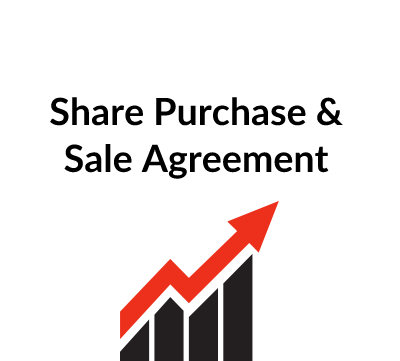 This share sale and purchase agreement is for use in the acquisition or disposal of a small or medium size business incorporated in England and Wales by way of a sale and purchase of shares. It is not suitable for a company with subsidiaries. The sale and purchase of a company usually involves a lot of ‘due diligence’ – i.e. inspection of books, accounts and records of the company by the buyer and there can be many tax and legal issues that need consideration by both sides. The support of professional advisers – in particular accountants and solicitors – on behalf of both the sellers and buyers is always advisable. These are largely self-explanatory but note the options relating to the accounts of the business. A buyer should take the advice of an accountant with respect to the accounts of a company it proposes to buy. Where completion is to take place some time after the normal accounts date for the company, the buyer may wish to receive “completion accounts” made up to the date of completion: these will normally be unaudited but should nonetheless provide a buyer with valuable and recent information. 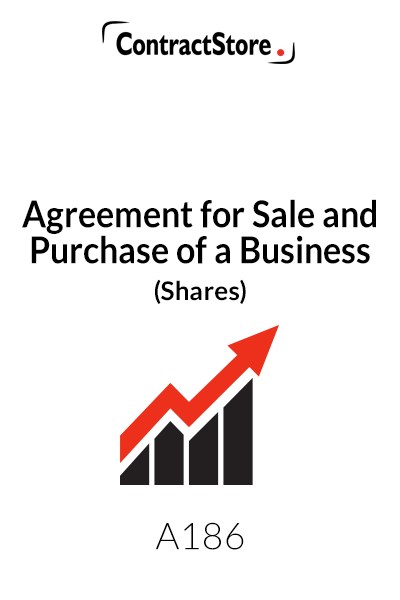 This clause sets out the basic agreement for the sale of the company’s shares by the sellers to the buyer. 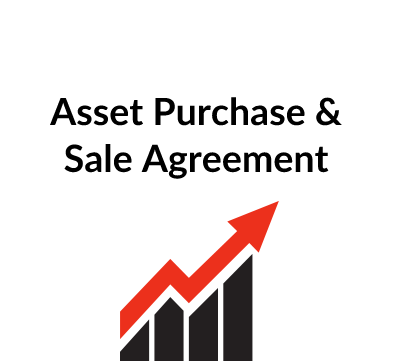 It also specifies that the sale shares are to be sold free of all charges and that the buyer is not obliged to purchase part only of the sale shares but is entitled to insist that all the sale shares are sold. This clause specifies the consideration to be paid for the sale shares. This clause sets out where and when completion is to occur (often the premises of either the sellers or their lawyers), the documents to be handed over at completion (e.g. share certificates, stock transfer forms and the company’s statutory books) and the matters to be resolved at the final board meeting held by the sellers. Note at clause 4.4 that provision is made for payment of interest upon any part of the consideration that is paid late. If payment is by instalments, interest might also be required. Where, as here, the consideration is payable by banker’s draft or bank transfer, the sellers should try to ensure that completion takes place in the morning of the completion date so that the completion monies are transferred to the sellers’ bank before the close of the banking day. This clause sets out the assurances concerning the company and its liabilities given by the sellers and upon which the buyer relies. There are 16 separate sub-clauses with warranties and undertakings covering a wide range of matters, from insurance and customers to the books and accounts. The wording of this clause requires careful consideration: the warranties set out here are fairly generic and additional warranties may be appropriate depending upon the nature of the business. Warranty clauses are often subject to considerable negotiation prior to the agreement being finalised. Also, the warranties may be qualified by the Disclosure letter: this will be prepared by the sellers with the assistance of their professional advisers, and will be attached to the Agreement. See the comments below referring to the Disclosure letter. Clause 5.13 provides a warranty as to pension obligations. 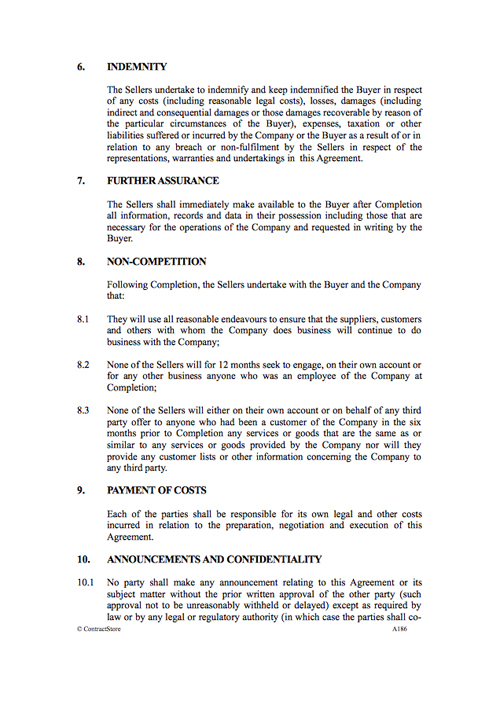 Please note that structuring the sale and purchase of a business by way of a sale and purchase of the shares in the business (as opposed to a transfer of the assets in a business) takes the transaction generally outside the scope of The Transfer of Undertakings (Protection of Employment) Regulations 2006 (“TUPE”) as the employees of the company will remain employees after completion when the company is under new ownership. Directors of the company who are also employees might be caught by the TUPE regulations and specialist advice is recommended here. Briefly, TUPE provides that employees transfer to a transferee on the same terms and conditions that applied with the transferor, restricts the ability of a transferee to vary or terminate the employment contracts of transferring employees and gives those employees who were members of the transferor’s company pension scheme the right to join a pension scheme after the transfer subject to certain minimum conditions. This clause contains an indemnity from the sellers to the buyers for any losses that arise as a result of any breach of warranty by the sellers. An indemnity clause aims to put the party claiming under the indemnity in the same position as it would have been had it not been for the breach of warranties and representations on the part of the other party. An indemnity is helpful in that it provides a clear contractual basis for the party seeking to make such a claim. The party claiming under the indemnity must still prove its losses however. As drafted this indemnity is “open-ended” i.e. there is no financial limit on the damages that may be claimed. It is not uncommon for sellers to ask for a cap or financial limit on the level of an indemnity when the shares in a company are being sold. Appropriate wording to deal with such a provision would need to be inserted. This clause sets out the documents to be handed over to the buyer immediately after completion and further provides that the sellers are to sign all additional documents required to give effect to the agreement. This clause aims to protect the interests of the buyer in the company’s business from an attempt by the seller to use its knowledge of the company’s business to set itself up in business in direct competition with the company. It may need to be tailored to particular circumstances. The parties are to bear their own legal and other cost associated with the agreement. Clause 10.1 provides that both parties are to cooperate with each other in relation to any public announcements as to the share sale and not to make an announcement that has not been approved beforehand by the other party. Clause 10.2 gives the buyer protection against any disclosure of confidential information including trade secrets by the sellers. Note in particular clauses 11.2 and 11.3 which ensure that only representations and assurances contained in this agreement are to have legal effect. This is important in cases where parties may have been in discussion for some time before signing an agreement so that the parties are clear as to what has been agreed between them. The clause also prevents assignment by either party and makes it clear that no third party can exercise any rights in respect of the transfer. This is a standard provision which is useful to include so as to ensure that the parties are certain as to when and how an important document relating to the agreement is to be delivered. The governing law of the agreement is English law and the English courts are to have exclusive jurisdiction in relation to any disputes arising from the agreement. This is of often of crucial importance to a buyer as it will set out all matters that may reasonably have an impact upon the value of the business. It is also important for the sellers: to avoid claims under the indemnity clause for breach of warranty the sellers must give careful consideration to the extent and manner of disclosure. Matters that may properly be included in a disclosure letter would include: details of outstanding insurance claims (clause 5.7) claims made by customers (e.g. in respect of defective goods (clause 5.6), claims made against the company by employees or ex-employees (clauses 5.10, 5.11 and 5.13), bad debts. Where there are exceptions or “carve-outs” to be made from warranties given to a buyer these should be clearly stated in the disclosure letter.